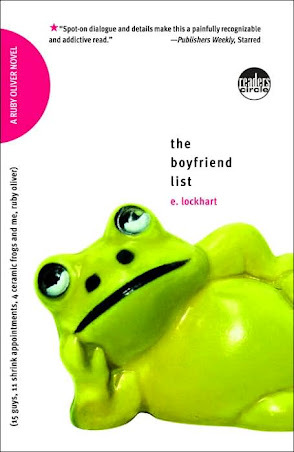 The Boyfriend List [Book Review] – my books. my life. Ruby Oliver is having a rough time. She lost her boyfriend, her best friends are no longer speaking to her, and she keeps having panic attacks. On her therapists suggestion, she makes a list of any boy she’s ever had any type of relationship with. Then tells us their stories. Ruby Oliver is a very believable (and very unlucky) teenager . She could’ve easily been annoying or depressing, but instead she was funny and likeable. I was just so frustrated for her, but I couldn’t stop reading the train wreck that her life has become. The stories of the “boyfriends” are woven into the present day story. While telling us about her current predicament, Ruby discusses her camp crush or her first kiss. It keeps the book interesting. I didn’t love this book – though I can’t quite pinpoint why – but I liked it and I am looking forward to reading the other Ruby Oliver books. whew. i did not like this book either. i thought the footnotes were distracting and i just couldn’t belive it was the FIRST book in a series. i’ve heard it gets better as you go along but i’m not sure i can muster up the energy to jump back into it. It sounds like it could be fun, in a very imaginative way, and would probably be a good book to just sit and consume over a weekend. I see that you didn’t love it, but I am glad that it kept you entertained!